A lot of people have talent. Talent is not always enough. To help the student to simply become” aware” is my approach with laughter. We have a great deal of fun in learning! My goals for the beginning or new student is to be aware of themselves and others … energy exchange is essential. Awareness of their abilities as an actor, their goals, their need for basic tools of acting and how to access natural talent, to risk in learning without fear of rejection in exploring attitudes, emotions, different roles, and to gain confidence through the process. For the advanced student holding up the mirror for them to see where they are, where they want to be, and how to get there. We become more aware by doing…we act. This is a highly competitive field. You can’t wish your way to an Acting Career! You have to know what you want and then be prepared when the opportunity comes! It takes some discipline, work, and a clear eye about your talent, abilities and your lack…where do you need more training. Make certain you have good teachers and do the work you need to do to accomplish your goals. Have fun in the preparing process! 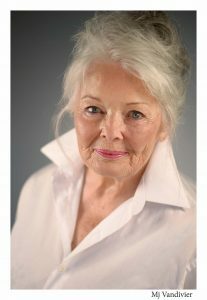 Marijane Vandivier is a professional Equity actress with over fifty-five years experience. She enjoyed a successful television career for 30 years including film, radio shows and commercial work, and has been an acting and speaking voice teacher / coach for the past 24 years. Mj studied at The America Theatre Wing in NYC where she appeared off-Broadway in “Late Arrival.” Vandivier holds a B.S. from the University of Houston in Psychology and Theatre and is a Certified Lessac Voice / Body Trainer. She played with her show band in Vegas, Reno, Tahoe, LA, and across the country for 7 years. Many Texans grew up with Mj on the popular KPRC-TV live children shows, “Happy Hollow and Marijane’s MagiCastle. Her long-running talk/news show “Wake-up Houston” was seen on KUHT-TV daily while she continued performing at the Alley Theatre, Theatre Under The Stars and Houston Music Theatre. Marijane moved to Austin 15 years ago to be with family. She has been an adjunct instructor at St. Edwards University, teaches for The Actor’s School, and for businesses and private clients as well as continuing to act professionally. In Austin, Mj has been featured in a variety of roles at St. Edwards Mary Moody Northen, Zachary Scott, Austin Playhouse and Tex-Arts Theatres. Most recently Vandivier appeared in The Crucible with Austin Shakespeare.